Grab all incoming leads and start tracking leads instantly from our sales management software. Wufoo is a web application that helps anybody to build amazing online forms. Thanks to Wufoo, you can kickstart your lead generation efforts in a few minutes! Built as an alternative to traditional CRM software, ClinchPad is perfect for small teams to get better at sales pipeline management. 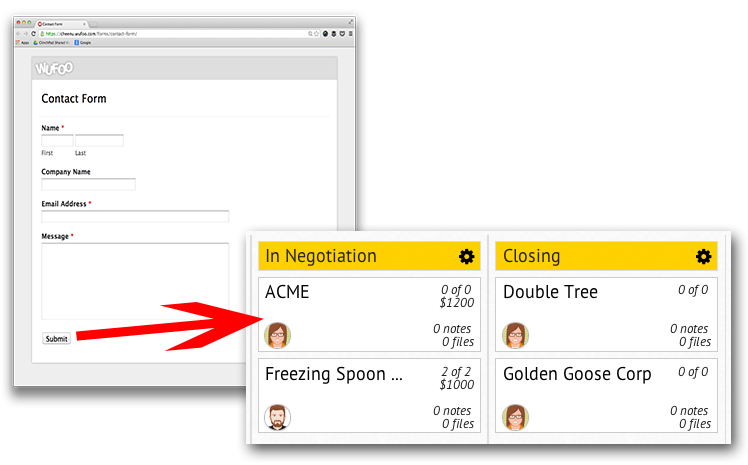 Collect prospective customer information and track these sales leads using ClinchPad's integration with Wufoo. A major chunk of organic and inorganic marketing efforts culminate in customers filling up a web form. Wufoo takes the pain out of building and maintaining webforms used for sales lead generation. For the sake of better conversion, it makes a lot of sense to automate the next logical steps of your sales pipeline, isn't it? By integrating your sales software and Wufoo, sales and marketing team collaboration becomes a walk in the park. With this webform integration with our online sales CRM, chances of leads gathered from a form going unnoticed are next to none. Thanks to the end to end, form field to form field mapping, you can be confdent of keeping your sales funnel full at all times! Sign up for accounts on both Wufoo and ClinchPad if you don't have them already. Create an form to capture leads on Wufoo. Follow the instructions in this support article on integrating ClinchPad with Wufoo. You're done! Now anytime a Wufoo form is submitted, it'll appear as a lead in ClinchPad.